Every year, I have these grand plans to only read new books. There are so many amazing books being written right now, there’s certainly not a shortage of possibilities when it comes to finding something new to read. And yet…I have old friends between the covers of the books that sit on my shelf who call to me from the library, enticing me to spend another few hours with them, reliving their adventures. And so I find I’m an unabashed re-reader. I can’t seem to help myself. Re-reading is like a big bowl of mashed potatoes and gravy. Or super cheesy homemade mac and cheese. It’s comfort food for my soul. New books are good, don’t get me wrong. A new book is exciting — there’s that fresh smell of the unknown (even in an e-book!). It’s a chance to meet new people and go to new places. It’s an adventure every time you open up a book that’s new to you. Each page is a discovery. And I love that. But a re-read is like curling up on the couch with an old friend. Maybe you haven’t spoken to them in years, but you can pick right back up where you left off with nothing awkward or stilted. Because you know them inside and out. And yet, there’s always something new to discover – a wrinkle you hadn’t seen before, or a grey hair where you previously didn’t notice it. So what about you? Do you re-read? Do just have certain authors, or books, who you revisit time and time again? What are your long-lasting favorites? I have re-read some books before that ech time is like the first time I am reading it. One of my favorite is Nothing last forever. It’s such a good book outside of my normal genre. Lately however I am trying to catch up with the new books that I have. I love those books where each read has something new! I seldom re-read anymore. The lure of the new books awaiting usually overrides the ones I’ve already read. I will re-read when a book in a series is next up but I’ve forgotten the previous book. My memory has gotten bad of late so if I feel not remembering will detract from my understanding or enjoyment then I will re-read. I’ve also been wanting to visit Camdyn in “A Reason to Run” by Christina Coryell. For some reason that book resonated with me. I have several books/series that I reread very year without fail!!! Not a re-reader unless it’s the Bible or one of the assigned books from my children’s language arts class. If I had 24 hours in a day to read, would definitely re-read, but there isn’t enough time to re-read AND enjoy all the great new-to-me books out there! Hi Elizabeth! As a high school English teacher for 20 years, I read and reread the classics every year; because if I didn’t invariably some student asked a question that I couldn’t answer. Now in retirement while watching four grandkids about 50 hours a week and with so many new authors and enticing stories, there is not enough hours in a week to reread. One book that I sometimes reread around Christmas is The Christmas Tree Treasure Hunt. Each chapter is written by a different author – fun clues and a trip around the world. I do reread & reread & reread my 4 year old granddaughter’s favorite book – 10 Little Princesses. I bet you have the classics close to memorized at this point! Time is definitely a factor with rereading. And The Christmas Tree Treasure Hunt sounds like a lot of fun! I re read all the time. In my hurry to read books by favorite authors, I always miss someting. I go back and it’s comforting. It really is comforting, isn’t it? I always say it’s like visiting with old friends. Back in the old days before indie publishing existed I re-read books frequently since there were far fewer books to choose from. Now that there are so many books on the market, I find I don’t have enough time to read all the books I want to read for the first time much less a second. I have a ton in my house too. :) Of course, the Kindle has made book hoarding a lot easier – no bookcases necessary! I consider myself an avid reader, but I do NOT re-read! I appreciate your comments though about re-reading! I have so many print books in my TBR pile as well as many Kindle books to read…..so can’t find time to re-read! 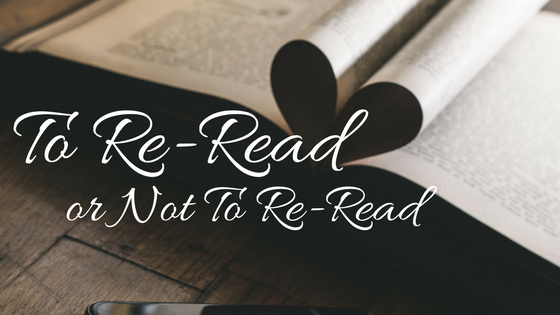 It’s okay not to re-read :) the massive TBR pile is definitely a concern. Not in the romance realm, but I re-read my paperback copies of Robin McKinley’s Blue Sword/Hero & The Crown books so often that I had to get new copies a few years ago. I love those books! They are definitely rereads. I love your notion that re-reading (thus, re-visiting friends) is “comfort food for my soul” — so true to me. My re-read strategy: screen what’s under “great” first, then if no story feels like re-reading, then the “good” and, finally, the “okay.” I’ll forget the other ones exist (and I should probably delete them, but it means going online and one by one deleting them.. and I just rarely have time online for myself, and when I have I just don’t want to think about this). I had all the books on my Kindle organized like that, it was so lovely. Then I got a new Kindle (the old one died) and I haven’t had the time or interest to reorganize them. So now I use the search a lot when I’m looking for something. I don’t have a kindle per se, but use my tablet and smartphone, I can actually import the categories I created in a previous device into the new ones. It’s quite clever. I have a few devices and they are all organized the same way. Can’t you use that feature on a kindle? Oh that’s nice. I’ll have to see. I’m guessing no, since the organization isn’t part of my Amazon account…but I’m going to look. I re-read all the time…Sometimes immediately after reading a book the first time. I love seeing new details on the second (or more) read through and if a book has been encouraging or convicting the first time through it usually is again on a re-read. I almost always find something new in a reread! I have always loved rereading! I still reread things from grade school even though I am in my 60’s. Of course, at my age I can’t always tell until part way through that I have read a book before. My Kindle sometimes gets confused and doesn’t indicate that I have already read the book. New books are wonderful as well so just depends on what I am in the mood for. Yay!! I have searched out several of my grade school favorites so I could have a copy to read when I wanted them. As a kid I used to re-read The Baby-Sitter’s Club and American Girl books but very, very few others and I’m pretty much the same way as an adult. I have read Jan Katon’s Mitford series 3 or 4 times but other than that it’s been years since I re-read a book. The Mitford books are very rereadable – I enjoy them. I love to re-read some books forced upon me as a student–as Mark Twain once said, “Education is wasted on the youth.” Now older and wiser, I appreciate those classics in a way I never could as a greenie…i.e. Lord of the Flies, Catcher in the Rye, To Kill a Mockingbird, Jane Eyre, The Crucible, Gatsby, etc. The Bible also never fails to astonish me–something new can be gleaned every time you re-read Scripture. And of course, it’s just fun to read some good old beach-read authors, too. No re-reading for me. I don’t have time to read the new books. Time is definitely in short supply these days. I haven’t re-read a book in many years. Too many new ones waiting to be read. When my husband and I moved to a new house last year I got rid of many of the books on my shelves that I had already read. I kept a very few favorites that I thought I may re-read at sometime or if I felt they might be one I would like to loan/recommend to a friend. It’s good to pass things along if you don’t think you will reread them. I just culled my own shelves of books I haven’t reread in several years. I normally don’t re-read books because there are so many books out there waiting to be read that I don’t want to take up the time re-reading a book I’ve already read. That seems to be a pretty popular opinion — I think we’re relatively evenly split between the re-readers and the not-re-readers! Love your books and looking forward to reading it. definitely re-read!! Some books have been on my shelf for decades and read over and over again! It’s like a comforting visit with an old and good friend over coffee. Something to look forward to. If a book is really good, I’m not as sad at the end, because I know I’ll be back.